On average, areas of the country that are suitable for cool season grasses have cold winters with temperatures that fall below freezing and warm summers, without extended hot periods. Usually there are regular intervals of rain throughout the summer months. To keep a cool season lawn green throughout a hot, dry period, requires supplemental lawn irrigation. Cool-season grasses will tolerate, more or less, some extended periods of draught by going dormant. Extended drought (longer than 4 weeks) combined with hot temperatures, will cause death of the turfgrass. New blends of the turf-type tall fescues are also becoming more widespread. 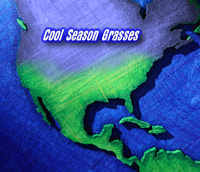 Cool season grasses are most actively growing in the spring and fall when soil temperatures are 65 degrees or lower. Look at the grass' texture to tell it from other types. Coarse tall fescue's big blades and bunching characteristics look rougher than bluegrass and rye's narrow, fine leaves. If your grass has thin, needlelike leaves it is probably a fine fescue. Kentucky bluegrass is true green like fine fescue, but turns brown easily during hot weather. Look for new cultivars of tall fescues noted for their reliable dark green even in summer, and perennial ryes that sprout bright green, then darken. See an old lawn with dead patches? Think bent grass, now popular only on golf courses because of its high maintenance requirements. Rye and tall fescue sprout and take over quickly compared with bluegrass and fine fescue grasses. Most of the older fescues are likely to bunch up and form unsightly clumps over a period of years. However, new varieties of fescue are less likely to do this. Tall fescue needs little additional irrigation and stands up to regular use as on heavy traffic areas such as a playground. Bluegrass needs regular irrigation to survive extended hot-dry periods and is more sensitive to heavy traffic. Creeping grasses like bluegrass, Bermuda and most warm season grasses spread by runners, either above or below ground. Creeping grass varieties are more prone to thatch and extra precautions should be taken to avoid thatch build up such as regular aeration treatments. 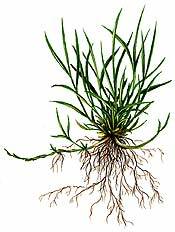 Bunch grasses such as fescue and ryegrass spread from the crown or central part of the plant. Mowing high protects the crown that is more sensitive to being damaged if cutting is made too close to the center.